Holds stronger & longer. 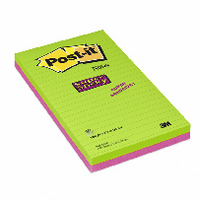 Super Sticky adhesive holds stronger & longer than most sticky notes yet removes cleanly. Perfect for hard to stick surfaces including computer monitors, doors & walls. In Ultra colours. 45 sheets per pad.124x200mm Approx Dimensions (CM): D20.4 W12.7 H1. Approx Weight (KG):0.1871.